You never know who is reading your blog... 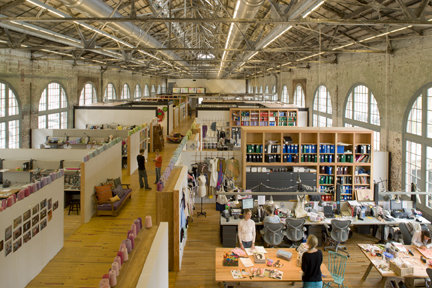 The other day, I wrote about A Stitch in Time, an informative image packed article in the May issue of Metropolis magazine featuring the Urban Outfitters corporate campus. To my delight, the architect and design team on that project, Meyer Scherer & Rockcastle, Ltd, contacted me offering images to show decor8 readers. 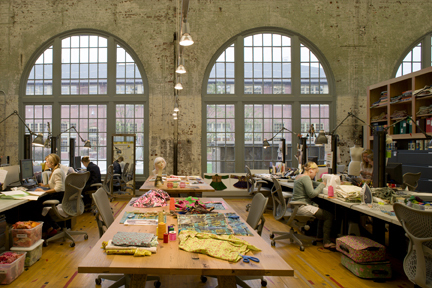 Located in Philadelphia's navy yard in 5 historic industrial buildings, this office space is exquisite. With that being said, enjoy the tour below. For more images, click here to view a mini slide show I've created. 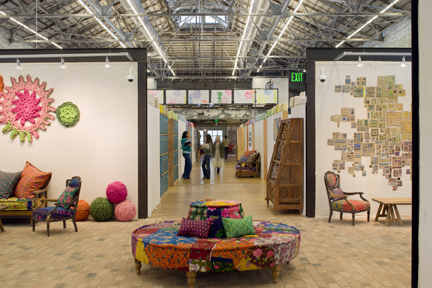 Haven't we all had dreams of working amidst larger than life balls of yarn, sitting in beautiful chairs, and passing by a wall loaded with buttons? This is a super creative environment where I think anyone could blossom, look at this place! You'll have to excuse me, it's just that I get excited about office space, as it was a huge part of my former life managing facilities and working on space redesigns and I often think about it in my sleep, still. But wow, look at this space, not only are the buildings spectacular, but I love the overall flow and how spacious it feels, it's like a city within a city. I also like how they've carved out all of these creative spaces where groups can congregate to chat and that the work areas are clustered together with low wall cubicles or no wall at all. It gives one a sense of belonging to a group, a team, vs. being stuffed into high wall cubicles and isolated from those you're working with. For me, the greatest lure is that an old, abandoned property was transformed and reused for a new purpose instead of either sitting there and slowly falling apart or worse, bulldozed. 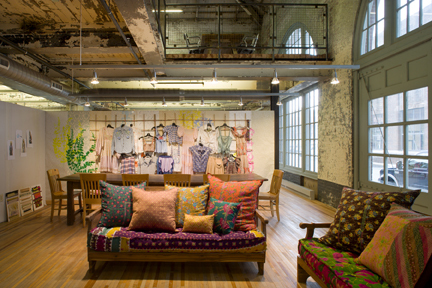 Urban Outfitters brought new life into an otherwise dead navy yard. 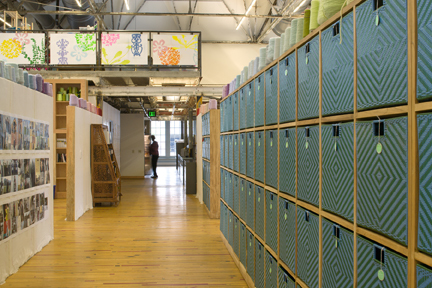 It's so important to reinvent a space intended for a different purpose in a new, creative way. Firehouses and old schools are now condos in many neighborhoods as are houses of worship. It's such a smart way to go. And, as these pictures show, no one had to sacrifice because it's much more impressive because of its bones and history. Thank you Ligeia for the images! For more views of this space, click here to view a mini slide show.